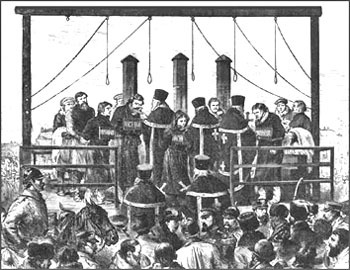 Executed on 3/15 April 1881 for their participation in the assassination of Alexander II one month earlier were Nikolai Kibalchich, Timofei Mikhailov, Nikolai Rysakov, Sofia Perovskaia and Andrei Zheliabov. Read the textbook pages 375-79 and 456-63. Check the remarks by Professor Blois and Professor Evans on the growth of the revolutionary movement. Read chapter 25 from Mary Platt Parmele (1843-1911) A Short History of Russia (1907, 4th edition). This is optional reading. For 50 points maximum extra credit, read Franco Venturi, Roots of Revolution: A History of the Populist and Socialist Movements in 19th-Century Russia (Rev. Ed., 2001), one of the greatest scholarly works ever written about Russia--and it was written by an Italian--and write a one-page paper in which you explain the origins and development of the Russian populist movement. For 50 points maximum extra credit, read Fedor Dostoevskii, Notes from the Underground (1864) and write a one-page paper that provides insight into Russian society of the 1840s. There are some truly memorable scenes in the book, especially one involving a five-ruble note. For 50 points maximum extra credit, read Fedor Dostoevskii (1821-81), The Devils (1872) and write a one-page paper explaining his portrait of the Russian revolutionaries. For 50 points maximum extra credit, read E. H. Carr, The Romantic Exiles: A Nineteenth-Century Portrait Gallery (1933) and write a one-page paper in which you look at the personal side of the lives of the Russian revolutionaries. This is a great book! For 50 points maximum extra credit, read Nikolai Chernyshevsky, What Is To Be Done? (1863-65) and write a one-page paper in which you answer the question, "What was Chernyshevskii's answer to the question that he posed?" For 100 points maximum, do the wikipedia analysis paper on an entry connected to Russian history and culture. For 25 points maximum extra credit, read Sergei Nechaev's Catechism of a Revolutionary and write a paragraph that answers the question, What was the underlying political philosophy of Nechaev? For 25 points maximum extra credit, read Sergius Stepniak on Nihilism and Narodnichestvo and write a paragraph that answers the question, What were the basic characteristics of the Russian revolutionary movement according to Stepniak?